friends don’t let friends take Lariam, but what about pregnant friends? 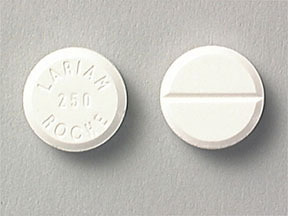 The New York Times reported on Monday’s announcement by the US Federal Drug Administration that mefloquine hydrochloride — aka Lariam — “must carry the so-called black box warning on its label because of the danger that the drug could cause serious neurological and psychiatric side effects, some of which can become permanent.” For those who don’t know, Lariam is often taken as prophylaxis against malaria. Lariam is not the only anti-malarial prophylaxis one can take. When I travel to malaria-endemic countries (and am not pregnant) I always take Malarone, which has been shown in randomized double-blind trials to be as effective as Lariam as malarial prophylaxis, but to have fewer adverse effects. I always thought the travelers I met in malaria-endemic countries taking Lariam were a little odd, probably because of a pre-conceived bias I had based on what I already heard of Lariam. I wondered why they would take this drug that could potentially make them hallucinate in a place that is not their home? They could take Malarone, like me (but it is expensive). Or doxycycline, like some of my friends (but it makes people sensitive to the sun). Or something else. In fact, because there are many options, I wondered why the news about Lariam even mattered — just take something else! One oft-cited upside to Lariam is that it’s taken weekly (instead of daily, like Malarone and Doxycycline). A friend also remarked on a Facebook posting of the NYT article, “Unfortunately [Lariam] is also the only anti-malarial safe (and effective) to take during pregnancy.” I wondered: is that true? Pregnant women are particularly vulnerable to malaria as pregnancy reduces a woman’s immunity to malaria, making her more susceptible to malaria infection and increasing the risk of illness, severe anaemia and death. For the unborn child, maternal malaria increases the risk of spontaneous abortion, stillbirth, premature delivery and low birth weight – a leading cause of child mortality. Despite the clear need for safe and effective antimalarial drugs for use in pregnancy, the pharmaceutical industry is reluctant to develop drugs specifically for this indication, and in almost all cases in which a new drug is being developed, use in pregnancy is contraindicated. The US Center for Disease Control and Prevention (CDC) recommends mefloquine (aka Lariam) for prophylaxis in pregnant women. Chloroquine has also been used in pregnant women, but has lost favor because of the rise of chloroquine-resistant strains of malaria. The CDC advises against pregnant women using Malarone, Doxycycline, and Primaquine. So what does an expectant mother do if she plans to travel to a malaria-endemic country? Most docs I’ve interacted with simply say: don’t go. That advice is echoed by the CDC and the WHO. And, it isn’t just limited to the chance of catching malaria, but to other potential risks. Use of antimalarial drugs in pregnant women continues to be a problem in which the risks to the woman and fetus are not completely known. More information on the correct doses to be given to pregnant women is desperately needed. Large-scale trials and post-market surveillance systems to monitor drug safety in pregnancy are required. Below is a list of some potentially useful resources. If haba na haba readers have any additional information, please share in the comments. Advising on travel during pregnancy, by Natasha L Hezelgrave, Christopher J M Whitty, Andrew H Shennan, and Lucy C Chappell, published in the BMJ. Preventing malaria this year has been particularly taxing for travelers due to a shortage of doxycycline. In June, it cost over $200 for a 1 month supply versus the $10 I paid in 2010. But the good news is that there is now a generic form of Malarone on the market. I got 2 months worth for only $20. This compares to almost $10 per pill in 2010. I’ve never taken larium/mef due to the side effects, but had similar problems after taking Doxy for an extended period- aka lucid dreams. Plus, in my experience, doxy causes all sorts of other problems like fatigue, upset stomach, severe acid reflux, and increased sensitivity to side effects from other scripts / alcohol. Now I only take Malarone. Thanks for the post. I wasn’t aware of the prejudice against pregnant women in the prophylaxis development community. fwiw – I recall (pre-generic Malarone days) some (especially student) insurance plans only covered doxy/lariam, and the gut issues for some w/doxy was the reason folks I traveled w/ were on lariam. That switched for me at OSU between my 2005/2006 trips (I did not have Malarone as an option the first, did the 2nd). Personally, I couldn’t get malarone covered and it was too expensive for me to pay out of pocket. Doxy was cheap when I looked, but I didn’t like that doxy had sun sensitivity (and to be more honest, that it lost effectiveness if you drank alcohol). I may have underestimated the risks of taking lariam, but I had the most amazing, vivid dreams while I was doing fieldwork. They weren’t negative and nothing persisted. Maybe I was lucky. Thanks @abedgell, I had no idea that there was a generic malarone. So, a reader forwarded me a link to a published paper of his that shows mefloquine (Lariam) could have negative effects on fetal development. The combination of atovaquone and proguanil to treat malaria was patented by Glaxo Wellcome in 1999, with patent protection due to expire in 2013. Glenmark Generics has already had a generic formulation win FDA approval in 2011. In February 2013, the United Kingdom High Court revoked Glaxo’s patent on account of obviousness, clearing the way for generic versions to be sold there. In order to achieve pregnancy, you required to know what’s inside your body which enables you to have a baby. The more you know their facts and functions, the easier you overcome those challenges to conceive or become pregnant. I work on malaria programs, and traveled to malarial countries while pregnant. I am totally with you on refusing to take Larium/mefloquine. I have never taken it, and would certainly not take it while pregnant. I don’t think anything else is approved for first trimester use in pregnancy outside of quinine as a curative, but women living in endemic areas are advised to take multiple routine doses of Fansidar/SP at one month intervals to treat any undetected malaria infection: http://www.who.int/malaria/areas/preventive_therapies/pregnancy/en/. It is not officially recommended for pregnant travelers, but it seems to me that there is good safety data available on the use of SP in pregnancy so I personally would feel much more comfortable with this option. I should footnote this all by saying I’m not a clinician and have no clinical knowledge! An advisor from the Motherisk program (Toronto, Canada) suggested to me (if I have understood correctly) that the reason Malarone is not recommended for pregnant women is simply that there haven’t been any studies done to conclude that it is safe. (What drug company wants to risk doing a study on pregnant women?!). I was told that there were limited studies (3 of them, with 26, 81, and 149 participants, respectively), in which no increased risk from taking malarone was shown. But because these are small studies, no real conclusion can be drawn. Im pregnant in week 25 and will soon go to Mozambique. I have talked to plenty of doctors in Sweden (most of them say – stay home or take lariam but two of them now say no to lariam, take malarone! I feel torned… I dont want to risk my babys health, and I dont want to have Malaria… Help and advice – anyone? Did you end up taking Malarone? I’m in a similar situation and my doctor recommended it. Thanks so much Sanna for your reply! Hope you’re feeling well. Have an easy labor and delivery! Thanks, Sanna from Sweden, for sharing your experience. Wishing you a safe and happy delivery. Thanks for the article. Having taken Lariam more than once I can safely say I would rather get malaria a hundred times over than have to go through that again. I know plenty of people who have taken it as well, at bare minimum everyone has intense side-effects, night terrors, feeling like walking through a fog. I can’t believe they would recommend that for pregnant women, should be taken off the market entirely. I just took malarone. No side effects…just take with food to avoid dizziness. I was taking Lariam at the same time I fell pregnant with my third child. I took three doses. He was diagnosed with permanent hearing loss at birth. Hearing loss has never been an issue on either sides of the family. I love him to death and hearing loss is just a part of who he is but I’ll forever hold it in the back of my mind! I took Larium for a month in 2001 and 5 months in 2004 with no noticeable side effects. Who knows? Maybe I am lucky. I recently found out I was pregnant and will be traveling to a malarial region. Does anyone know any new research (good or bad) about Larium and pregnancy? I took Larium and fell unexpectedly pregnant 8 weeks after finishing the course. I was told it would be fine by my GP. My baby, who is now almost 22yrs has suffered ill mental health for most of his life (including, similar to amandaoj’s baby, hearing impediments). As a child and adult he has displayed similar symptoms to the many soldiers (and others) that have used the drug. We have a daughter who is very balanced and easy going, so its hopefully not us! We love our son unconditionally, but no amount of love seems to be easing his suffering. Although medications effect us all differently I would advise ‘Do not be tempted to use this drug’! I have a family member with schitzophrenia and anxiety/depression. I’m wondering if this drug or LSD can be removed from the body. I’d know if this was a cause if I knew if it would be something a teen might take. Does it cause a high? Or could it have been slipped to her like in a drink by someone? I’m looking for a reason for the schitzophrenia other than hereditary as that doesn’t seem to be the cause. If I could identify a med that causes these symptoms and it was available to teens/something they may be taking now or then, then I could research to find out how to get it OUT of the system. On another subject, I take doxyclycine for bronchitis. Is this a dangerous drug? Thank you.